When I provide a quote to a client, one of the services I mention in the quote is quality assurance (QA). It is an important part of the service I offer, and is vital for large projects to ensure consistency and coherence. 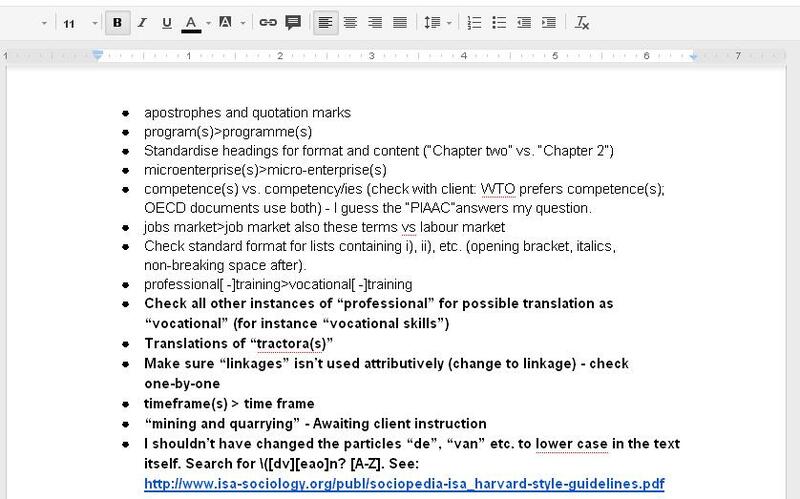 A good technique I’ve found when working with a colleague, such as a reviser, is to make my QA notes in a Google Doc, which the reviser can read and edit. Here is a snapshot from a recent project I completed, the translation of the OECD’s Latin American Economic Outlook 2013 into English. 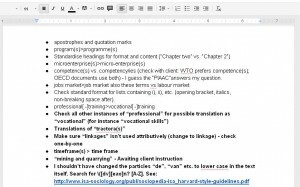 Time is not wasted trying to standardise certain aspects before the translation and revision are complete, especially since a different decision might be adopted later down the line, duplicating your work. For instance, whether to use single or double quotation marks (inverted commas). I can warn the reviser not to worry about certain issues that I will take care of myself during the final QA. For instance, any occurrence of “program” where “programme” should be used. The reviser can use the document to warn me of any inconsistencies he or she has spotted that should be looked at during QA. On large projects, QA is a very thorough process. The above screenshot is just a snapshot of what was in fact a four-page document. The final page included a whole list of find/replace routines using regular expressions. For instance, this client requires that a non-breaking space is used between a number and the words million or billion, which I can achieve using a regular expression, rather than making sure I remember to use the non-breaking space every time when translating or revising the document. For publications, QA is a vital part of the editorial process, and when requesting a quote on a translation you should ask your client what QA procedures will be used.